that is a seriously great painting, Hallie! who could guess that shadows could be so poignant? Well...I love that red door too. It's all beautiful! Thank you Celeste--I've always found shadows interesting. There was no way I could photograph this so I just had to keep looking each night. Had to eliminate the side lights by the door--they would have messed up the shadows. Love your wonderfully original subjects ! Hi Jane. My small front porch is one of my favorite subjects.. I don't turn the light on because tiny birds sleep in the corners. Oh I just find this so interesting and unique!! I think you did a great job, Hallie! Thank you CrimsonLeaves. I've always noticed the shadows from the streetlight but carrying Willie slowed me down and made me really look. I think you can purchase a foldable ramp online, I have seen them (recently in airline magazines) for pets that can not make it up and down in homes (although I don't know how many steps are on your front porch). Its amazing how caring for a pet is terribly time consuming. Your shadows are fun. Hi Robin. It's only three steps, but I think Willie had trouble even before surgery. We had just had the porch and steps repainted because Willie had worn out the one spot he always used to climb the stairs--and he had to make a circle before climbing. We'll figure something out; he's much better. Oh, I wish I was your neighbor! I would know what is going on. Too funny. And I like the sketch and I bet it would've been easier to do the old fashioned way. But practice makes perfect. Be my neighbor, Sue--I'll ride around in the art golf cart with you. I have great neighbors. Drunk or crazy...... but so do mine......it's way more fun that way! Shadows and light such interesting subjects. I hope poor Willie appreciates you and plants you with kisses and snuggles! Happy October to you, Hallie. I think Willie actually likes his dad better. His dad just sits on the porch with him--I'm the one with the pills and the monthly flea/heart worm treatment. Happy October to you, Carole. I love the shadow and I can just imagine you dancing on the porch at night. A ramp sounds like a good idea. You sure I can't come live with you and be your apprentice? No- don't answer that. I doubt there is enough room for me, Jeff, three more dogs and five cats plus a squirrel that has adopted us. Never mind. My apprentice, PAMO? I am a perpetual student. We do have a 400 sq. ft. guesthouse--might be tight--I remember your cartoon with all your animals (and a horse) in the bedroom. Willie wants to go out now and I'm trying to watch Project Runway (always makes me want to get out my sewing machine). Thank you, Pam. Apps are fun; the problem is they can always be changed. I'm thinking that if I replace my shadow with Santa's shadow and add a wreath, this might be my Christmas card. Hallie- That will make a fantastic Christmas card! I love the image. Project Runway always has that effect on me too. Hallie, so very sorry to hear of Willie's injury and bd knees. Heartbreaking to see your little guy suffering. He has the very best caregiver, though. Love how you captured your experience in art. I need you here to teach me how to use the art apps! Your subjects and renderings are always unique an recognizable in any medium. Hi Mary. Welcome back from your world travels. Caretaking has kept me in the house so I spend lots of time on the iPad. I think the only way to learn apps is to play around (I'm an expert at playing around and getting little done). a little drink never hurts. 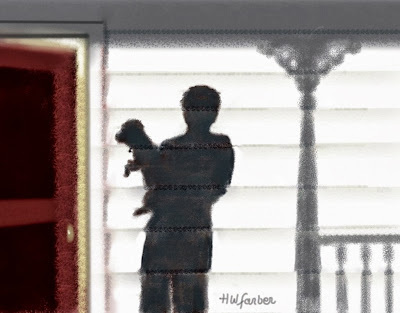 I really like this with the shadows of you and Willie and the trim on your house. One drink, CaroleKing, and I probably couldn't make it up the stairs. I like the curlicues on my porch, too--1890--inside is totally rebuilt and modern. Yin and Yang.